The ruined temple of Wat Ek Phnom offers a look at the architecture of the Bayon period, and is also the site of an ornately designed modern temple. 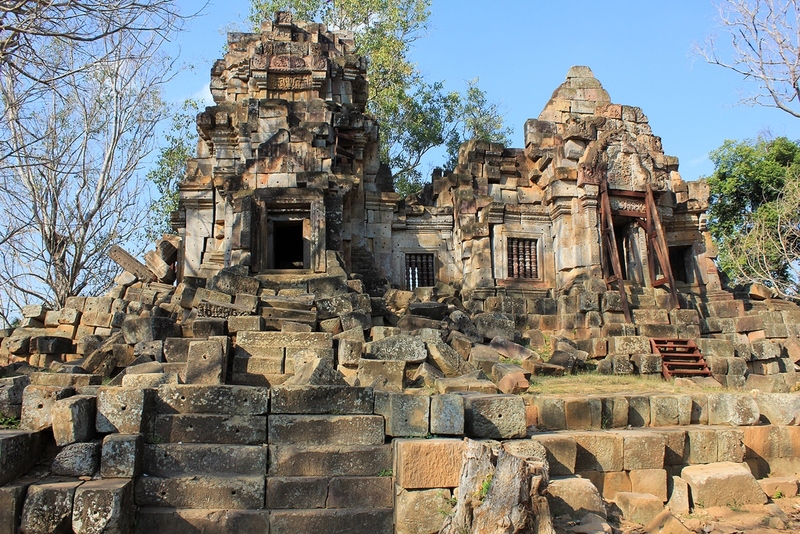 The Hindu temple was constructed in the 11th century during the rule of king Suryavarman I, and although in disrepair and heavily looted, remains highly regarded for its intricately carved lintels and pediments. Around the site, you'll also have a chance to inspect the modern temple, boasting pillars and intricately rendered frescoes, and a large white sitting Buddha. Before you head to Battambang, plan trip itinerary details with our user-friendly Battambang trip app , to make sure you see all that Battambang has to offer, including Wat Ek Phnom. 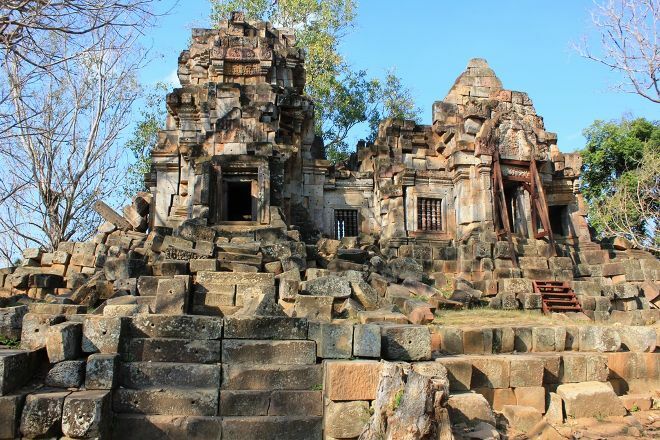 First, there is the Brahmanist temple of the 11th century, in bad condition and obviously less attractive to visit if you have already traveled through Angkor. However, we can see some interesting sculpted pediments and lintels. There is then the modern Buddhist temple, very colorful and covered with paintings relating the life of Buddha. On the site quite frequented by the locals who made it a place of pilgrimage and Pic Nic, one can also see a huge statue of Buddha seated, a little decrepid all the same. The road to get there is beautiful... With beautiful rice paddies and Khmer houses... By cons The temple is quite poorly preserved, it is in the process of disarticulation.... Damage.... Now there are so many wonderful temples besides that if you don't have too much time, you can zap. The scenery to access the site is worth a visit. The Buddha of the 11th century looks at you with an air that speaks volumes about his experience. To each of appreciter-or not-there are so many temples to see in the vicinity. Every day, we help thousands of travelers plan great vacations. Here are some tips on how to use your Listing Page to attract more travelers to your business - Wat Ek Phnom. Promote your permanent link - https://www.inspirock.com/cambodia/battambang/wat-ek-phnom-a8102215707 - on your website, your blog, and social media. When a traveler builds a plan from this page, the itinerary automatically includes Wat Ek Phnom. This is a great way for travelers looking for a great vacation in your city or country to also experience Wat Ek Phnom. Promoting your link also lets your audience know that you are featured on a rapidly growing travel site. In addition, the more this page is used, the more we will promote Wat Ek Phnom to other Inspirock users. For best results, use the customized Trip Planning Widget for Wat Ek Phnom on your website. It has all the advantages mentioned above, plus users to your site can conveniently access it directly on your site. Visitors to your site will appreciate you offering them help with planning their vacation. Setting this up takes just a few minutes - Click here for instructions.